I need to preface this review by stating I devoured the first in this series, Faith Hunter is the Urban Fantasy author I'm most likely to recommend to fellow readers, and Jane Yellowrock series is an all-time favorite of mine. The first in this series was fresh, unique, with one of the most intriguing main characters I've read to-date. Nell. Something happened. Sophomore curse, maybe. Where the first book was killer, the second book is usually a bit rocky. This is the second installment in the Soulwood series and it cannot be read independently as a standalone, as it directly ties to the first installment. At the start, Nell graduated Spook School, joining the team to work preternatural cases. The Nell we all came to know and love was not on the pages. She was an ex-cult-member, a young widow, and unsure what her talents where or whether or not she was even human. She communed with her land, putting it above all else. She was slightly cold after her upbringing and socially inept by today's standards, as she lived off the grid in a lifestyle more befitting the early twentieth century than today's world. She modernized so quickly, after a quarter of a century of living one way, and only four months of another, that Nell felt like an entirely different character who had no personality whatsoever. In this installment, the tedious details murdered the story, dragging the pacing down, until there was nothing of any interest on most of the pages. See my disclaimer on how much of a fan I am of the author and understand how I do not make that judgment lightly. Not only would Nell explain every single article of clothing, every time she dressed, she would also have on the pages a list of which belongings were on her person, right down to pens and paper, laptop and cellphone, and all the devices and gadgets that came along with the job. Once was enough, maybe two or three times during the novel as a reminder when those items became of use, but this occurred several times per chapter. When Nell spoke, long gone was that backwoods, backward widow who grew up in a cult, but was someone who spoke more technical than Ricky Bo, who was her boss. Was I proud she was so intelligent? Sure. But I wanted Nell back. Clinical. Cold. Redundant. Unemotional. A seasoned investigator of one of the most boring paranormal mysteries I've ever encountered, dead geese and oddly behaving deer around a pound. Missing was the connection to Soulwood, her family, the disturbing culture of the cult, the bond she was forming with her new colleagues, and the budding tension with Occam. Nell would draw the reader into experiencing the events, then would rehash it with Ricky Bo, and then would yet again with any colleague not present, ad nauseam, repeat it all again and again, making one event seem like ten in the scope of the pages. Only to do another event in the next chapter in the same manner. It wasn't interesting the first time around, riddled with tech-speak, clinical terms, and all matter of things that will go over most readers' heads. Most of which will get skim-read after the first part of the novel, as they are repeated nonstop thereafter with no need to read it YET AGAIN. Never would I have guessed this book would be a struggle to even read a chapter at a time. Not after I thoroughly looked forward to it after such a promising debut in this series, which I felt shined so brightly, instead of being cast in Jane Yellowrock's shadow, which was a fear of mine. Only now, during book two, the voice of the story, the characterization, and the 'feel' weren't there. I'm going to be honest. If you can skip 20% of a novel and not be confused when you pick up reading, not missing anything, even in an investigation, there's no substance and all filler, with unnecessary details, devoid of character development. I do feel badly giving a critical review, and I hope the next in the series is given new life – a spark of something worth holding onto for the reader. That spark that makes us anticipate what's to come next. The debut was so promising, amazing, with characters who were beyond intriguing. Had I read the second book first, or read this series prior to Jane Yellowrock, I would have missed out on so much entertainment, because I would have cut my losses and passed other books by. It's that promise of what I know could come in other books that will have me read the third installment. 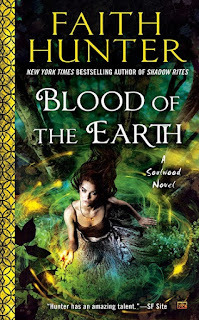 For reviews & more info, check out our Blood of the Earth post. 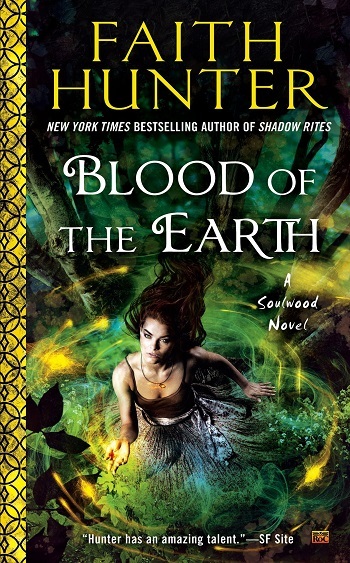 New York Times Bestselling author Faith Hunter writes three series: the Jane Yellowrock series, dark urban fantasy novels featuring Jane, a Cherokee Skinwalker; the Rogue Mage novels, a dark, urban fantasy/post-apocalyptic series and role playing game featuring Thorn St. Croix; and the Soulwood Series featuring Nell Nicholson Ingram. 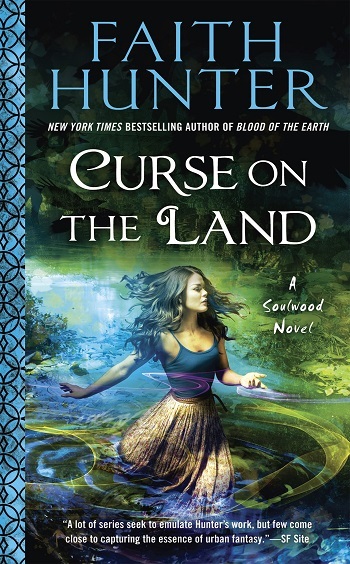 Erica reviewed her personal copy of Curse on the Land (Soulwood #2) by Faith Hunter for this post.